In our LifeStraw review, we discuss the brand, our use of the LifeStraw Go and LifeStraw Flex, and why we love them both. At a recent blogging conference, we met a LifeStraw representative. We’d heard of the brand before and vaguely remembered seeing ads showing people using, what looked like a straw, to drink directly out of streams and lakes. We were curious, so we sat down with her as she enthusiastically told us about LifeStraw and its many products. She even drank out of a bowl that had very questionable looking water, using a LifeStraw! We were convinced that we wanted to try a bottle, especially since we knew that we’d soon be on trips where we could use them. She generously offered us two different bottles to try. Below is a bit more about LifeStraw and our experience with our two bottles. The LifeStraw mission is simple; they believe that everyone deserves to have safe drinking water. Therefore, they create innovative products and work with governments, donors, and individual consumers to spread awareness of global water issues and provide communities all over the world with safe water. With every purchase of a LifeStraw product, a portion of the proceeds go to provide water purifiers to schools in developing countries that don’t have access to safe drinking water. LifeStraw also performs quarterly follow-up visits and routine maintenance to ensure the purifiers are being used correctly. It’s obvious the LifeStraw family cares deeply about their mission. So how does LifeStraw work? Well, it uses an advanced microfiltration membrane (hollow fibers that look like a bundle of strings). Basically, the membrane traps contaminants. Water is able to pass through, but any contaminants that are larger than 0.2 microns are trapped. Sounds simple enough right? But this advanced technology is able to remove up to 99.999999 percent of bacteria that produces waterborne diseases. So using LifeStraw greatly reduces your chances of contracting illnesses such as diarrhea, dysentery, and Giardia. We currently have two LifeStraw products; the LifeStraw Go and LifeStraw Flex. We’d seen plenty of LifeStraw reviews, all saying the products were great, but we were curious to try them for ourselves. LifeStraw Go comes in a variety of colors, but we got it in purple (Vicky’s favorite color). It’s the perfect water bottle; you can use it for hiking, camping, travel, or as an everyday water bottle. We’ve used it multiple times during our adventures around Florida, and most recently during our girl’s weekend in Sedona, Arizona. We got a little thirsty. Good thing we had our LifeStraw Go! The LifeStraw Flex is a little more… flexible lol! It has a soft bottle, which makes it more versatile. We think this bottle is perfect for if you’re trying to travel light and/or save space. We use it when we fly because it folds and it fits snugly into the pockets of our Osprey backpack. It also saves us money, since buying water at the airport is super expensive! Pro Tip: Also save money with these Travel Accessories Under $20. You couldn’t even see it once it was in the pocket! We only had two complaints about our LifeStraw bottles. 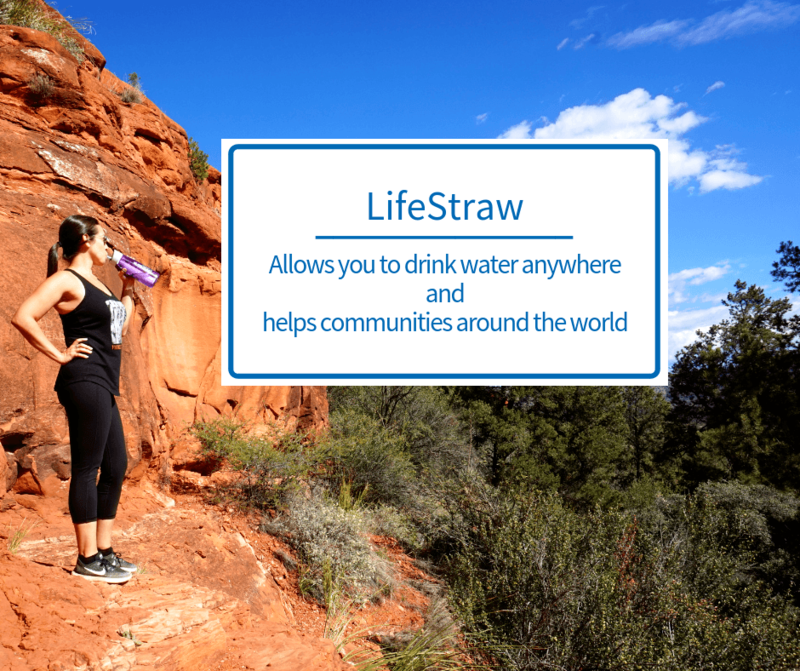 With the LifeStraw Go, the carabiner can’t be taken off. We thought if you unscrewed the top you’d be able to remove it, but it’s under another lip. The carabiner is obviously useful for attaching the bottle to things, but when it was placed in a small day pack we were using, the carabiner kept banging on the side of the bottle and the sound was driving us a little bonkers. So it’d be nice to be able to take the carabiner off if not needed. With the LifeStraw Flex, once it was filled with water it was a little awkward to hold just because it was so squishy. But if we held it more towards the top of the bottle it was fine. We love our LifeStraw water bottles! They’re durable, versatile, and we love the mission of the company and all that they’re doing to help communities around the world. Although we didn’t get to test them by filling them with water from a river or other natural source of water, we completely trust that they would filter out any bacteria that would make us sick. LifeStraw offers a lot more products than just the two bottles we have, so if you’re interested to see everything they make, you can click here. We think you’ll really like their products. And remember, for every purchase you make, you’re helping disadvantaged communities around the world. I love this idea Vicky. Awesome way to cut down on trash and to enjoy water all over the globe, worry free. Definitely Ryan. It’s such a great product! I give all my support to innovative products like LifeStraw 🙂 The news about how Earth is warming so fast is really alarming. We need to act soon before it is too late. Wow, it is also very affordable. Price is less than USD 50. I want to buy one of this soon. Oh yeah, it’s scary for sure! I love this approach Vicky! Any way we can cut down on garbage is the right way to do it. We think so too Kevin!